The lore is Tolkien for a ride. 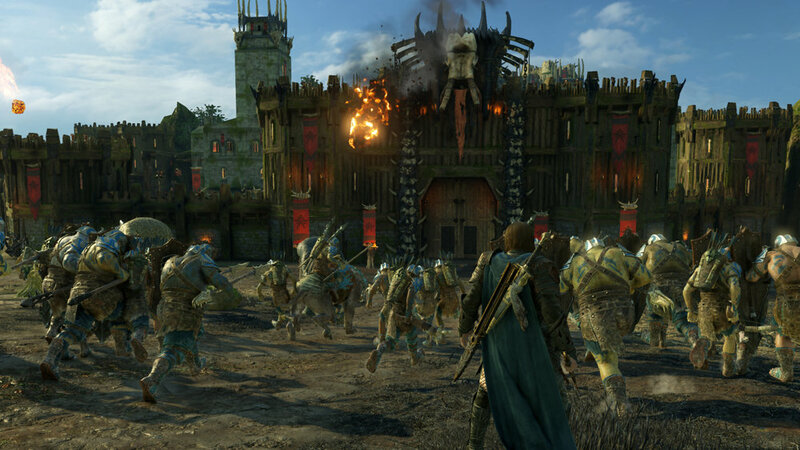 When Middle Earth: Shadow of Mordor released in the fall of 2014, it introduced the Nemesis system, a gameplay hook that would create variations on existing foes and allow them to become your very own custom enemy. It was an ambitious design that paid off as while the story itself was fairly lackluster, the Nemesis system was a wonder to behold. Shadow of War is a bigger and mostly better sequel in almost every regard and has added an unbelievable depth and variation to the Nemesis system, making it one of greatest gameplay designs of this generation, but this system can only carry the rest of the game so far. The story follows Talion and Celebrimbor crafting a pure ring of power, one that lacks the evil energies that the "one" ring was famously known for. It's not long into the adventure when that ring is taken from them, by a human-formed Shelob, and this is where the lore of The Lord of the Rings is taken for a mystical ride to fan fiction territory. For those wanting a tale told within the proper lore, well, you'll have to go elsewhere as Shadow of War plays it pretty fast and loose with the holy Tolkien works. You are once again playing as Talion and frankly, I am not sure why. Sure, it makes sense from a narrative standpoint, but Talion feels almost forced into this story and has no real drive to be here, unlike his role in Shadow of Mordor. The problem is mostly that Talion is boring and just isn't that interesting of a protagonist, and even Celebrimbor starts to repeat a lot of the same dialogue again and again. We are introduced to Eltariel, the blade of Galadriel, and she is a really interesting character who thankfully we see a fair amount of here and one that I would love to play as in future DLC expansions. The game is based heavily around the Nemesis system and much of its plot is actually worked around it. There are various side quests that easily rival that of the main story, which isn't bad by any means, but there is one questline in particular that actually had me a bit sad, even conflicted once it was all over. Lore alterations aside, there are some really enjoyable moments here as you'll see the rise of Minas Morgul, an epic boss battle against a Balrog, and the past tragic histories of several of the Nazgul. The Nemesis system has been completely overhauled to allow a much deeper variation to the Orcs and Olog's that you'll encounter, combat, and dominate to fill your ranks, or possibly fall victim to them and see their rise to power quicken and become more powerful at every turn. These custom enemies will now wield various elemental weapon types, be resistant to certain abilities like your freeze attack or simply just be arrow-proof. Despite a mechanic designed to give you a chance to recover some health from a possibly fatal blow, I came across an Olog that would bypass that safeguard and could kill me almost instantly. This fear of instantly falling in battle had me consistently on my toes as you weren't sure what the next battle would bring. While these devastating attributes are one thing, each of these foes also have weaknesses that you will uncover from lesser enemies called Worms. The information you can gain from these enemies will inform you of the strengths and weaknesses of each captain and give you an edge in battle. There are also certain factors that can occur during battles that send them into enraged states, making them stronger and attack far faster. Some enemies can even learn to adapt to your tactics and put a stop to certain actions you'll take, giving you one fewer move in your skill set. As you move around each of the five locations in the game you will constantly run into these custom foes and often are ambushed while taking on one or even two of these enemies at once. I had one situation where I was hunting a hefty Olog captain and was ambushed by an Orc I thought I had killed, only for him to show up with a metal helmet over his burnt face. This would have been a regular walk in the park if I wasn't ambushed again by two more Orcs, ones I hadn't yet had the chance to meet before. To make matters worse, a Graug showed up and wanted to hug me during the battle. While I survived the encounter, the Olog captain retreated during the chaos and I had to then go and track him down yet again. While the destructive forces of these enemies vary in degree's of difficulty, they also vary in their personalities as well. I've run into Orc's that sing, speak in verse, scream uncontrollably, and one who showed up with their very own hype man, another Orc whose job was to talk them up and make them sound even more threatening than they were. While you do run into a few voices repeating, and a few lines overlapping here and there, I lost track as I attempted to count how many variations I would come across. I've chatted with friends who have played just as much of the game as I have and several of them had not encountered the same types as I have come across, and vice versa as well. The five locations that you'll visit; Seregost, Nurnen, Gorgoroth, Minas Ithil/Morgul, and Cirith Ungol are fairly different from one another visually but tend to repeat much of the same needs as each has the same types of locations, collectibles, and overall function. You'll arrive at each location and start to pick away at the fortress until you have taken over each of the captains and then storm the fort to take down the Overlord in charge. For a vast and wide-open game, it falls into a rinse and repeat method far too often, which is why I think I enjoyed the side quests so much, as they broke away from much of the same mechanics that repeat throughout the story. There are collectibles to get that are somewhat lore based, but considering the lore is rather twisted up here, they had no real weight to them and served only as another tick in the box of things to do in the game. Talion moves under two conditions; movement and combat. I'll get into the former shortly, so let's talk combat. For anyone who played Shadow of Mordor, you will feel right at home here as not much as changed. Both this and the prior game use the exact same combat system that Rocksteady perfected in the Arkham series of Batman games. You'll mostly mash down the attack button and look for button prompts to then dodge, block, or jump over the attacking foe. It's a system that works very well for small to mid-size battles, but when the action gets a bit too frantic and large-scale, then it can be hard to know who you'll jump over, and should it be an Olog who is resistant to the jump-over attack, then you'll get choke slammed down to the ground and become an easier target. During your battles you will utilize skills that can be unlocked via skill points; these are earned by leveling up or through completing certain tasks like Celebrimbor missions or by unlocking all fast travel locations on a map. 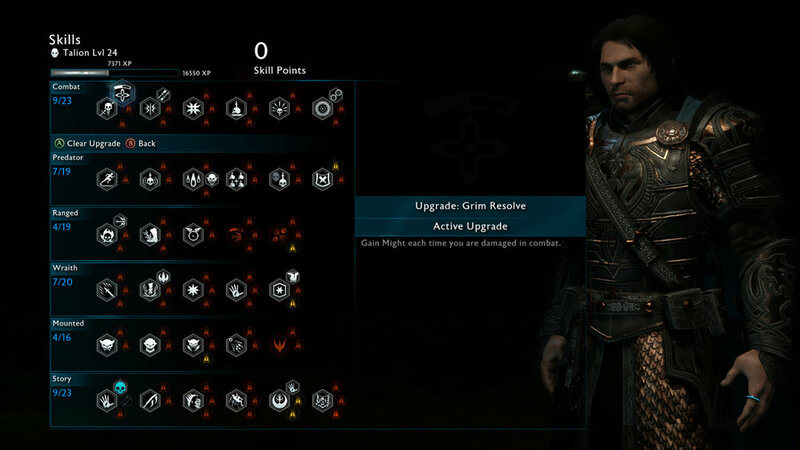 The skills are separated into categories and each skill then has a few alterations to them to give a slight bit of customizing to your Talion. One skill I recommend to try to unlock early on is the ability to collect your loot by simply running up to it, as opposed to having to stand there and press a button to accept it, often getting blindsided by a foe as you do so. You can teleport from enemy to enemy with Shadow Strike, making it far easier to get from spot to spot on the map. You can execute enemies with a single strike or pin them down so they can't run away. Talion can control various creatures for use in battle or for simply just getting around the map, and once you unlock the drakes, well, you can get around pretty fast. Movement and targeting are where the game suffers greatly from and can impact just how much fun you can have. First, Talion walks so damn slow that you'll often be running as fast as you can as you attempt to hunt down your prey. The problem is that Talion is a clinger and often will reach out to a nearby wall as you are attempting to run past it or through a doorway as you attempt to race down the fleeing captain. I had so many moments where I had to just accept this problem and continue upwards and climb over where Talion wanted to go as the dropping and letting go systems are just too damn slow. While it wasn't enough to completely break the game, it still worked better than the targeting that Shadow of War has to offer. Targeting enemies to either dominate or kill can be either really satisfying when it works, or rage inducing when it doesn't. To give you an idea of my frustration with the targeting system, let me provide an example as it will get my point across a lot better. There are several missions where you need to remain undetected while you take out a selection of targets. As I approached my final target from up high, while looking below and seeing a group of enemies around a campfire, I approached the single foe as he looked over the ledge. As I pressed the button to stealth kill him, Talion lept from the ledge and down to the group below, killing one of those around the fire, exposing me and failing my stealth mission. This wasn't the first time where Talion attacked at a foe I wasn't targeting and it is even worse when you are trying to dominate a captain in the middle of a battle as you'll have to fight with the positioning of your character so he isn't trying to dominate one of the several Orcs around him. This can get even more difficult when surrounded by several other captains as you don't want one of the captains you want to dominate become enraged as this prevents you from dominating them until they calm down. Unlike the previous game, Shadow of War is based around loot. Whereas the prior title used runes to give you the edge in battle, you now have swords, bows, and armor to outfit Talion and the game does a great job at dishing it out. Each item has a rarity and can be broken down into currency to purchase loot boxes to earn better gear, and if you think this is the last I'll talk about loot boxes in this review, well, it won't be. Higher rarity items come from a few different sources. You can solve the poem puzzles in each area, take part in online vendetta missions, which I'll touch upon shortly, or from taking out legendary ranked captains. Each quality piece of gear has a challenge to it that will allow the gear to be upgraded upon completion. There are also gems that can boost the level at which dominated captains will rise or the amount of damage you can dish out, and these are equipped to your gear and depending on the item, will offer different perks. While Shadow of War is mostly a single player game, it does have some online offerings that benefit greatly from the loot boxes offered in the store and this is where the game can work its way into being something fairly controversial, and pay-to-win, at least in some regards. Loot boxes come in two formats; in-game currency and paid currency. Now, while you can earn some of that paid currency in-game, it is painfully slow and only there to tease you by allowing you to see what treasures await you should you pony up some real money. The paid-currency boxes contain far better gear and far better Orc captains that you can use in protecting your fortresses. While I can't really see the appeal for the weapons portion of the boxes as I found some items in-game that really worked for me, and frankly, I was finding some pretty damn good gear by doing the online vendetta missions, which are where you will get revenge on a captain that killed another player. These missions often rewarded me with some of my best gear and I found myself always tackling these missions whenever one would pop up. The post-campaign final act of the game is where the loot boxes become far more tempting and almost required, as I never once during my time with the game, ever felt the need for buying them. This final act has you storming a massive amount of fortresses that get progressively harder and the amounts of enemies that you will encounter will easily outmatch your captains, should you only be building your ranks just enough to storm the story-based fortresses. You can send your captains to the pits to train, but unless you really devote your time to making them extremely high level, and of course, weeding out those with low stats or weaknesses to fairly common attacks, you will simply be sending them to the slaughter when attempting these challenging bases. But of course, you can bypass all this captain grinding by simply buying better quality Orcs via the paid-currency loot boxes, but even those can die quickly during these encounters and force you to rebuild your army stronger and stronger. It is a loop that sadly doesn't have any sort of pay off as the 'real ending' cutscene is just not worth it. Shadow of War looks its best when dealing with the more fantastical elements of the series; creatures, fantasy locations, and the visual effects of the Tolkien lore all look incredible. Apart from some poorly modeled human characters and the odd muddy texture, Monolith Productions has a very good looking game here. Xbox One will be getting a Xbox One X patch for 4K support, and PC already has this feature. I've heard that some setups on PC has the game crashing fairly regularly, and if you are one to use video recording software, this can lead to even more crashes. One of my favorite elements to Shadow of War is its score as the music is just flat out incredible. Combine that with the often hilarious voice acting for each of the captains, and you have a very solid effort in the audio department. Shadow of War enhances everything that was revolutionary about the Nemesis system but sadly doesn't bring a game to match that ambition. While it is great fun to dominate enemy after enemy and begin your rise to power, there just isn't enough variety to keep the game from falling into a repetitive gameplay loop. The side quests are hands down the best content in the game, but sadly there are just too few of them. The combat is still as fun as ever and the added systems of loot can make for a good time, even despite the storefront staring you in the face each time you pause the game. If you can deal with how frequent you are completing the same tasks over and over again, this trip to Mordor can be a good time, just try not to spend any real money in the process. middle earth: Shadow of war WAS PURCHASED BY THE REVIEWER. ALL SCREENSHOTS WERE TAKEN ON Xbox One.